Louisville, KY (October 2, 2014) – To everything there is a season, and Kentucky’s drivers must once again brace themselves for the annual three-month increase in roadway encounters, and collisions, with the most dangerous animal in the United States – the white-tailed deer. The Insurance Institute for Highway Safety (IIHS) estimates that each year white-tailed deer cause car accidents across the nation that are responsible for tens of thousands of injuries and the deaths of approximately 200 Americans. Those collisions also carry the hefty price tag of $4.6 billion in insurance claims annually. Vehicular collisions with deer increase during this time of year in conjunction with the annual peak season for deer migration and mating. Kentucky’s exploding deer population has only expanded the opportunities for these accidents to occur. Deer are also naturally on the move during this season, and urban sprawl has introduced many new roads into the natural habitats of these animals. Consequently, deer are seen and struck on the roadways during the last three months of the year almost more often than all the other nine months combined. Kentucky State Police (KSP) data reports that Kentuckians were in a total of 2,766 automobile collisions with deer last year (32 fewer than in 2012), resulting in 132 injuries but no deaths. However, Kentucky Farm Bureau (KFB) Insurance claims data also shows that these collisions have clearly defined seasonal peaks. Approximately $21.2 million in deer collision claims were filed with KFB in 2013, but nearly 46% of those claims resulted from accidents occurring during October, November and December. 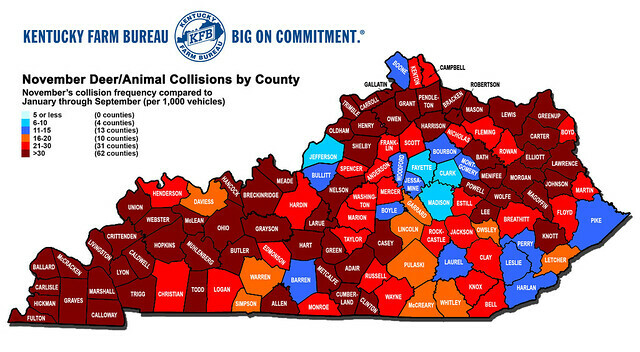 This map highlights a county-by-county look at November's annual jump in deer collision activity across Kentucky's roadways. Further analysis of KFB Insurance claims data from the past five years shows that automobiles collided with deer on Kentucky roadways at a clip of 28.51 deer per 1,000 drivers during the month of November, well outpacing the national average of 14.1. As a result of those collisions, KFB Insurance customers filed more than $4.7 million in claims just during November of 2013. Now that the seasonal jump in deer activity is here, motorists should take the time to be aware of their surroundings even more than usual. KFB advises motorists to drive defensively on the roadways this fall, especially when headed through wooded areas where deer are likely to be seen. Tips to help drivers avoid deer collisions: - Watch for deer crossing signs. These signs are posted to alert drivers that certain stretches of the road are commonly populated with deer – do not ignore the warning. - Be aware of the time. Deer are most commonly seen along roadways in the early morning and evening hours. Exercise additional caution if traveling during these times of day. - When driving after dark, use high-beam headlights to increase the range of vision. - If a deer is spotted on or near the road, slow down immediately. - Don’t swerve if a deer is in the road. Brake firmly but keep the vehicle headed in a straight line. A swerving vehicle can confuse the animal and prevent it from picking a direction to flee, and, worse yet, the driver could lose control and hit a tree or another car. - Always wear a seat belt. The Kentucky State Police says that most people injured or killed in automobile collisions with deer are not wearing seat belts. STORY FROM A DIFFERENT ANGLE: Peak season for deer activity impacts more than just motorists on the roadways. Click here to read how Kentucky’s growing deer population can also negatively affect agriculture.